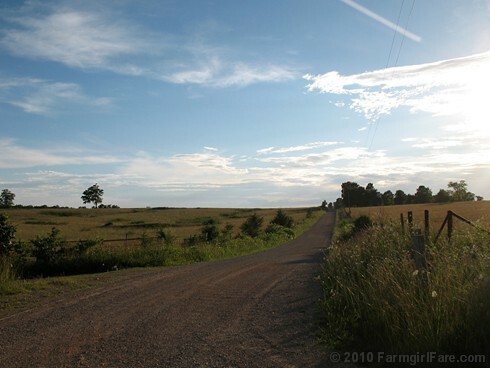 © FarmgirlFare.com, the faraway from most everything foodie farm blog where the closest milk for sale may be six or so miles down the road, but it's fresh out of a Jersey cow—complete with several inches of amazingly thick cream on the top of each gallon jar—and you can't beat the views on the drive home. Hmm - perhaps some of that lovely cream on top of blueberry bars? Glad you are getting out and making us all jealous of that beautiful Jersey milk. How beautiful! Would go out for milk just to see this exquisite view! That's exactly the kind of view I would want too! Hope your leg's doing well. now I have to go read through all the earlier posts and see if you sexed the new donkey yet. Lovely photo. I grew up with milk and cream from our own cow. I was the only one in the family that drank milk but I loved it. What, you don't drink sheep milk? the view...the ride...the milk...the farm = yum-o!! !